One of my favorite creative hobbies is mail art, AND one of my 2018 resolutions is to send more snail mail, so I’m going to walk you through three easy-to-create types of mail art. The first technique is decorating the envelope with patterns or doodles. You’ll need some blank envelopes, Tombow MONO Drawing Pens, Dual Brush Pens, a ruler, MONO Eraser and pencil (if you’re like me and have trouble writing in a straight line without guides). This technique focuses more on fun lettering and a little less on envelope decoration (although you could always combine the two for that extra WOW factor). Make the name of the recipient really stand out and have some fun with your lettering! Just make sure the address is still legible. The supplies you’ll need are blank envelopes, your Tombow Dual Brush Pens, MONO Drawing Pens, pencil, eraser, and a ruler. And now for my all-time favorite mail art technique. This one has the name and address of the recipient inside a drawing. This fun balloon design would be great with a birthday card, and click through on the Instagram post below to see how to use the Tombow Dual Brush Pens to create a watercolor-look umbrella design. For this technique you’ll need thick envelopes, a paint-brush, jar of water, Tombow Blending Palette, MONO Drawing Pens, pencil, eraser, and of course Dual Brush Pens in your favorite colors. Will you be creating any mail art in 2018? Today I've got a little tutorial to show you how to easily incorporate the 2018 Pantone Color of the Year, Ultra Violet, into your nursery or children's room. These easy-to-make nursery art pieces look great framed, and will only take you a few minutes to put together. Tombow Dual Brush Pens in numbers 606-Violet, and 603-Periwinkle for accents. I used the MONO Glue Pen to draw some stars and other little details onto my watercolor paper. Once the glue dries it acts like a resist and will keep that area of the paper free from color. Scribble some ink from your Dual Brush Pens onto your freezer bag. I added a few dots of Dual Brush Pen 528-Navy Blue for interest but that's entirely optional. User your spray mister to wet the freezer bag and ink. It pays to put some paper towel underneath in case any of the water or ink jumps off the bag unintentionally. Place your watercolor paper down onto the bag and press the back in circular motions to make sure the ink covers the whole front of the paper. Carefully lift the paper from the bag, and place it (ink-side up) on some spare paper towel to dry. 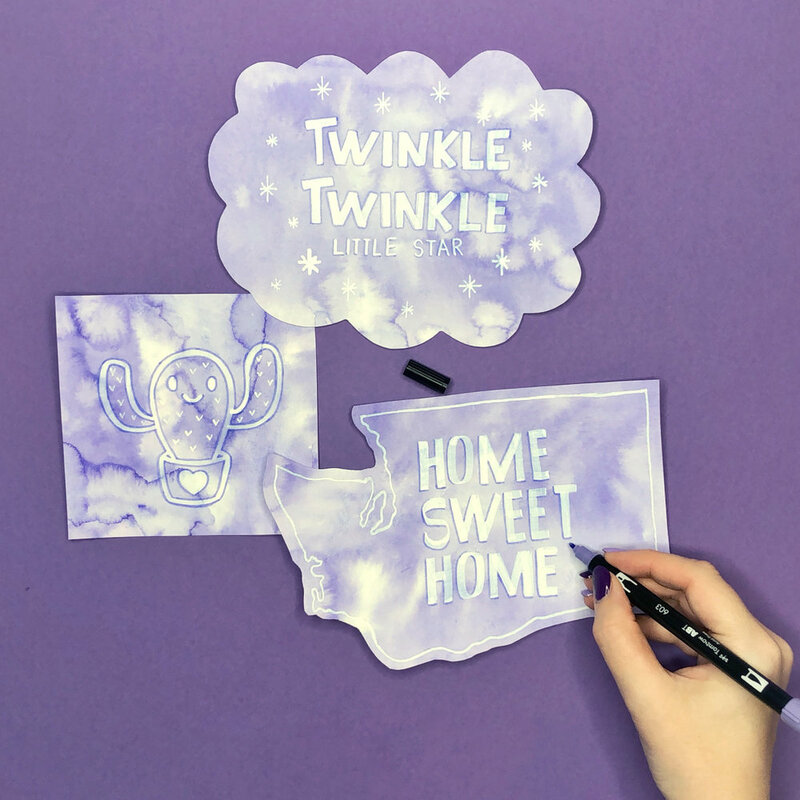 Draw your designs onto the dried watercolor paper. You can draw or write whatever you'd like. I chose an outline of Washington State with 'Home Sweet Home', a Kawaii cacti, and the words 'Twinkle Twinkle Little Star' surrounded by stars. You can also cut the paper into fun shapes to make them a little different. This is where I used the 603-Periwinkle Dual Brush Pen to outline the letters and help them stand out a little more. And you're done! Frame those babies and add a little Ultra Violet color to your walls! I'd love to see what you create, tag @BrownPaperBunny on social media to show me.